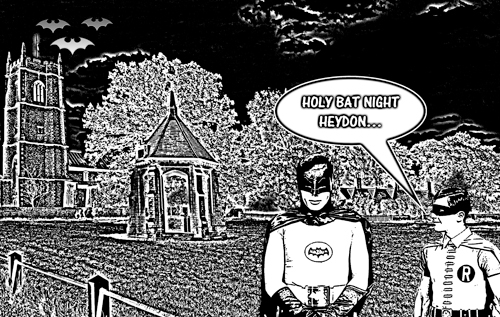 The Heydon Bat Night will be held at St Peter & St Paul, Heydon, on Saturday 11 August from 7–9 pm. This will be an informative, fun and educational evening with Philip Parker from the Norfolk Bats in Churches Project. Learn how these nocturnal flying mammals use the church and churchyard – and the challenges churches face when living with bats. There will also be children’s craft activities (with prizes), refreshments and the opportunity to watch bats emerge from Heydon Parish Church using state-of-the-art infrared cameras. There may even be some captive bats to see at close quarters. Admission is £5 per person and free entry for children under 15. All proceeds will be donated to Heydon Parish Church. If you would like to attend please RSVP via email to heydonvillageevents@gmail.com and confirm the number of places you require. Places are limited and will be allocated on a first-come, first-served basis. Please park in the village car park, behind the Earle Arms.